DETAILS Any pot that may get wet needs to be sprayed or painted with a protective polyurethane coating before and after you paint it. Cover every nook and cranny, including the drainage hole. Otherwise your paint may bubble and crack. 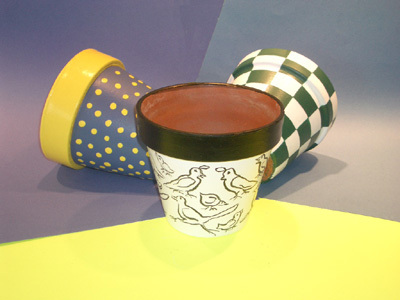 Using your favorite colors, paint the pot with latex paint. How you are going to decorate it is up to you and your imagination. This is not an all in one sitting project, your base coat needs to dry before you can add the design, so plan your time accordingly. The pot with the dots is perfect for a younger child as the dots are added by dipping the eraser on the end of a pencil into the paint and applying it to the pot. The pot with the birds is just one example of what you can do with your own art work. Think butterflies, flowers and more. The geometric design is exacting and time consuming. You need patience and time to make these painted flower pots.